Thanks to constantly evolving information technologies (IT), interactions and relationships between buyers and sellers, organizations and their members, customers, and clients, employers and employees, and coworkers have been going virtual, at the speed of light. Information and software based applications are being digitized allowing online delivery through wireless connectivity, VoIP, e-mail, text messaging and videoconferencing, which are replacing traditional landlines, phone systems, and the need to travel for either work or meetings. 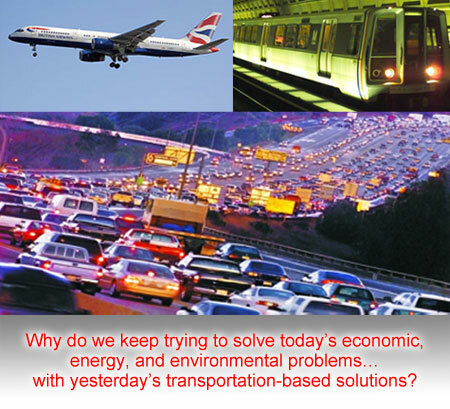 It has become obvious that current transportation based solutions which perpetuate inefficient working conditions, congestion, increased energy usage, harmful emissions, and the concentration of workers in overcrowded, ‘event prone’, urban areas are obsolete. They represent yesterday’s thinking and technology ~ tired, old, and inefficient. Plus, they will cost hundreds of billions of dollars to repair or replace, take years to show results, and are frequently outdated upon completion. The Telework Coalition (TelCoa) believes the way forward is to encourage interactions on the congestion-free, green, safe, energy efficient, and disaster-resilient ‘Information Super Highway’. Join us in urging Federal, State, and local decision makers to support legislation aimed at enabling, encouraging, and incentivizing the use of current information technologies along with necessary policies, processes and procedures (P³) rather than relying on yesterday’s industrial age business models and transportation modes. While everyone strives for economic, energy and environmental (E³) improvements, by partnering with us we can all turn this ‘New Way of Working’ into a reality for extraordinary levels of accomplishment, quality of life, sustainability, energy efficiency and security, and create new job opportunities for all including rural, disabled, and older workers who will be able to work regardless of their location. Reducing commuting costs is like receiving a pay raise, avoiding real estate expense has prevented many layoffs, and teleworking provides jobs equally without deference to geography.